This was a delightful story. It reminds me a lot of Narnia with the snow queen and her heart of ice. I loved the boy and Ophelia was a treasure. The setting was in a museum; what a unique and perfect setting for a middle grade adventure such as this. 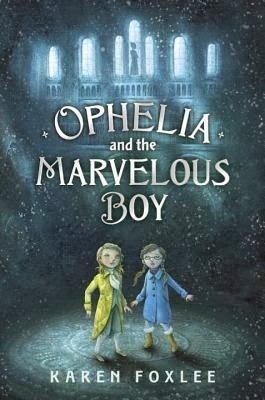 Picturing Ophelia running through the museum searching or the boy or the magic sword was so vivid, it felt like a movie. Sometimes you just need a wonderfully perfect book that is short, sweet, and full of imagination. For me it's more often than just sometimes, which is why I really value books like these that feel as classic as Narnia but are also as fresh as something new. I definitely recommend this book to everyone! It's so much fun, I'd read it again and I'd read anything this author puts out in a heartbeat. Love the idea of it being set in a museum; that alone makes me want to read this story. I have to admit, every once in awhile I wander the children's section of the library, fill my bag, and spend a whole week reading nothing but kid books. I love them (even though I'm no longer a kid). I think this cover is fab and I love the museum setting. Sounds like a fun, comfort read.